Here at The MED-EL Blog we’ve talked a lot about cochlear implants, but there’s far more to hearing implants than just CIs. Another type of hearing implant is a middle ear implant–but what’s a middle ear implant all about, and how does it work? As the name suggests, a middle ear implant is implanted into the middle ear. The middle ear consists of structures that receive sound vibrations from outer ear and direct them towards the cochlea. These structures include the eardrum as well as three small bones often called as the hammer, anvil, and stirrup. 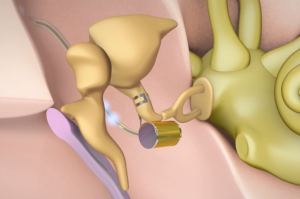 There are several places on these structures that a middle ear implant can be attached. There are a number of reasons why someone would receive a middle ear implant. The most common indications include sensorineural hearing loss or mixed and conductive hearing loss. You can read more about the different types of hearing loss in our post here. If you are thinking about a middle ear implant for you or someone you know, you should talk with your doctor because your doctor can help determine what options are appropriate in each specific situation. 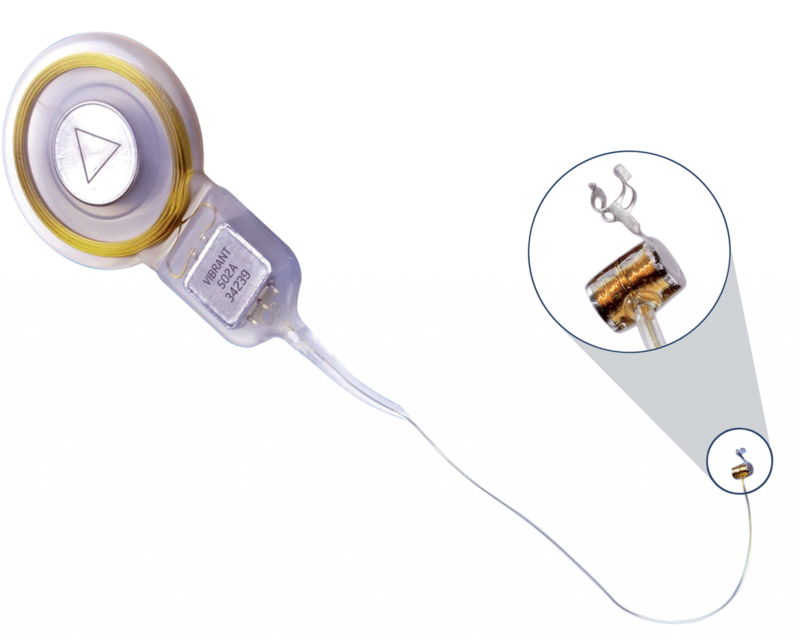 The VIBRANT SOUNDBRIDGE is a middle ear implant from MED-EL, and has been around since 1996. The heart of the SOUNDBRIDGE is the Floating Mass Transducer (FMT); it’s what you see magnified in the right side of the image. The FMT is about the size of a grain of rice, and it’s what puts the “sound” in SOUNDBRIDGE. How does it do this? It vibrates! The FMT has a tight coil of metal wire that receives electrical signals and converts them into mechanical vibrations. 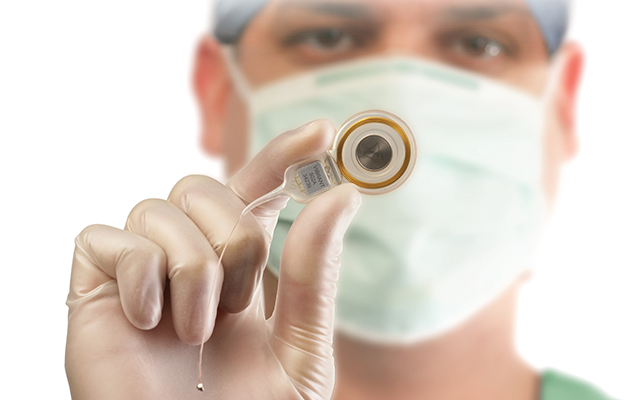 Electric pulses are sent from the external audio processor to the implant and are transmitted straight to the FMT. When it receives these specially-coded signals, it moves back and forth at up to 8,000 times per second. The FMT doesn’t just vibrate into thin air. To make sure that it conducts sound information most effectively, it is connected directly one of the structures in the middle ear. Which structure exactly? That depends on each individual’s specific type of hearing loss and middle ear anatomy. Here, the FMT vibrates back and forth to directly stimulate the middle ear bones. This sends sound information to the cochlea (at right) just as it occurs in natural hearing. This type of implantation is most common for someone who has sensorineural hearing loss because it amplifies the natural movements of the middle ear bones. In this case, the FMT’s vibrations stimulate the cochlea without needing to connect to the hammer, anvil, or stirrup. This type of implantation is most common when an individual has conductive and mixed hearing loss, because it is able to bypass the blockage or deformity that may be causing the hearing loss. 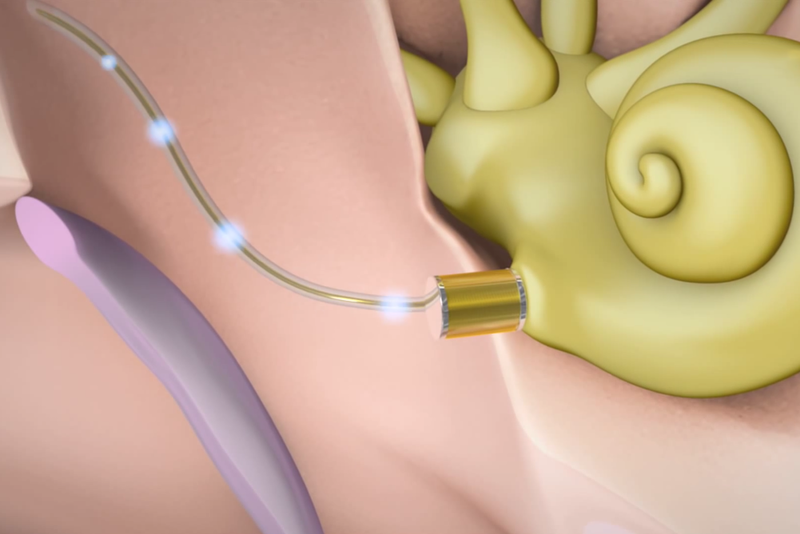 There are four different ways that the FMT can be placed next to the cochlea, so each surgeon has a wide range of options to make sure that the FMT can be used most efficiently every type of hearing loss and cochlear anatomy. If you would like to learn more about the VIBRANT SOUNDBRIDGE system as a whole, check out the MED-EL website here. And, if you think that you or someone you know could benefit from receiving a hearing implant like the SOUNDBRIDGE, why not contact your local MED-EL representative?